First stamp booklet with backing paper print - from last year. Following on from the Walsall-printed 2nd class Business Sheet (reported here) we can now show the first booklet reported on security backing paper (also printed by Walsall). 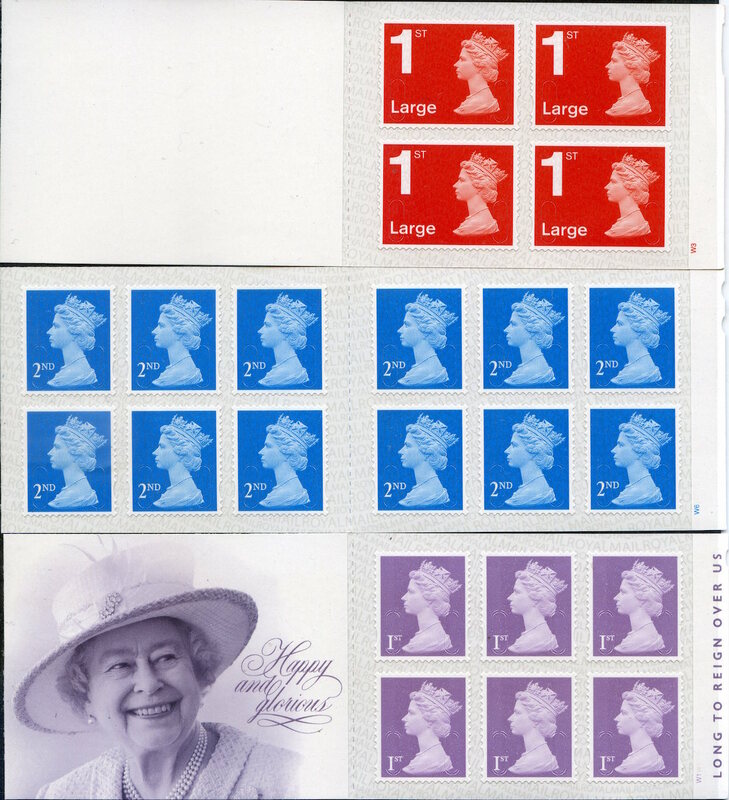 GW has sent this image of the Long To Reign 6x 1st booklet, with O15R year code. These ought to be fairly widespread but without knowing the size of the printing, it is impossible to know whether it will be plentiful. 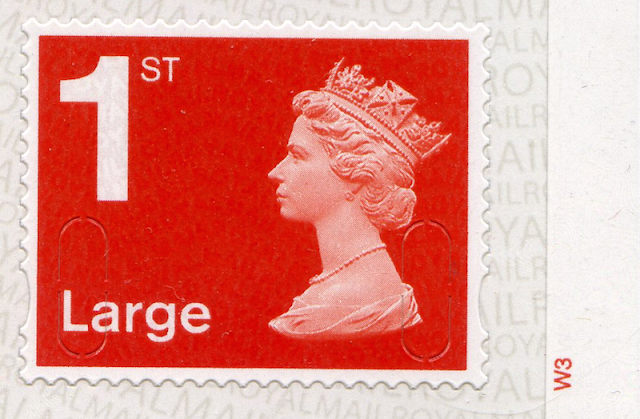 Further printing with O16R year code will surely appear later this year and those will also have the printing on the backing paper, but it may be that the O15R supplies will not be common. All have 2015 year code, and have the more recent duller phosphor. 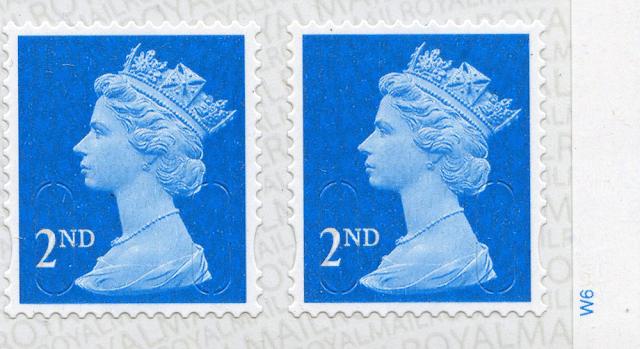 Interesting to note that the Penny Red booklet sold on 18 February has no security printing on the backing cover. 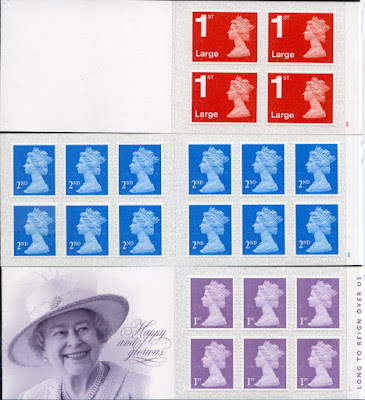 My local post office had one pack of 6x1st class 'Long to Reign' books with NO security printing. This pack was dated the 15/10/15. Local Tesco had a few books with security printing but no packet to check the date. I think that I might have misled some people with my blog report on the 6th February when I said 6x1st class 'Long to Reign' books with NO security printing. What I meant was NO security background printing on the backing paper. Very sorry to anyone who read this the wrong way. The subject of the Royal Mail using the Tullis Russell feature. Tullis Russell use the product name IN-Print. This seems to be causing much consternation among our hobby. Having read the comments from the 15th January postings. Let us look at where the printing lies; well it is not an under print on the stamp neither is it on the substrate. This leaves us with the backing(silicone)release area beneath the pressure sensitive gum. Thus, so as not to confuse the issue further for the hobby, I suggest that we call the feature "Backing Release Print" BRP for short. or "Silicone Underprint" appropriately shortened to "SiliPrint", I like this one. Why the use of the word "PRINT" when we see a text inscription. Why indeed; who is to say that in future we won't see an image or text and image together as the Release Print. What we need is commonality across the hobby not utter confusion. As Glenn Morgan wrote on the post about the business sheets, this printing is below the silicone-release layer on the paper. In my own list, and for convenience, I have started referring to it as PBP - Printer Backing Paper. That seems simple enough to be understood by collectors throughout the world. One thing that we don't know is whether Tullis Russel actually print it or whether it is printed onto the paper by 'a printer' before the silicone layer is applied by TRC.